IN OUR previous post we showed how SUEPO leaders and staff representatives are being abused inside the IU (EPO Investigative Unit). They’re gagged, so not much is known about what goes on inside. No wonder there are strikes this year. The EPO has become an embarrassing institution to work for, based on what EPO workers sometimes tell us. It wasn’t always like that. 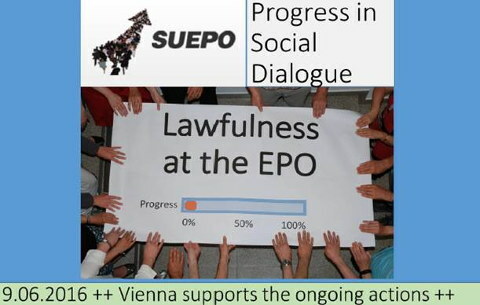 The EPO used to have relatively good reputation (we had an amicable attitude towards the EPO back in the Brimelow days), not just based on EPO mouthpieces. “The EPO has become an embarrassing institution to work for, based on what EPO workers sometimes tell us.”Based on the latest news, Board 28 was right to say there's a "crisis" at the EPO. Now, only a few months later, the top managers have begun quitting their jobs. Vacuum remains behind them, compromising the quality of operations (not just as measured by number of approved applications but actual patent quality). We are growing rather concerned that it puts in jeopardy the entire organisation (hence everybody’s jobs, including delegates’). When one sees his or her employees committing suicide under the Battistelli regime it’s not too shocking to see high-level resignations. If Battistelli does not step down pretty soon, signaling change and hope (to use the Obama buzzwords), a lot of other managers (even those in Battistelli’s circle but especially good, moral, respected ones) will vanish. This will compromise the entire Office, so the Organisation must act fast and decisively. This might also save lives (recall this letter from Ciaran McGinley about the fourth suicide). It could either mean personal damage control or jumping from the sinking ship (SOS Titanic) or both! The time will tell us. In our experience (writing about software), people often retire early right before (or shortly after) major scandals that jeopardise one’s ‘peak’ or memorable legacy. Our theory about this is that he cannot take it anymore, no matter the compensation (salary) working for incompetent top-level managers whom the staff hates so much that some commit suicide. There have been stories like this in other companies. That’s a sort of “acceptance” stage and appropriate action. We begrudgingly commend Ciaran McGinley for this decision, which surely he knew would damage Battistelli’s legitimacy before his potential sacking later this month (well overdue). I would like to inform you of my intention to take early retirement later this year, namely from 1st November onwards. I have informed Alberto yesterday evening and the President this morning. Since taking up my duties at the European Patent Office on 1 January 1982, it has been a continuous privilege to have worked in, and to have contributed to, this organisation. It has furthermore been an honour to have served under, and worked directly with, all six Presidencies. The last years have been especially enjoyable as Principal Director of Patent Administration and I would like to take this opportunity to acknowledge the wonderful contribution made by each and every one of you. Serving you since 1 January 2010 has been a highlight of my professional career at the EPO. However, looking to the future leads me to the conclusion that early retirement from the EPO is the right step both personally and professionally. After all these years, I believe that the circumstances are now such that it is time for me to move on. No doubt we will have the opportunity to share, reminisce and thank each other more personally in the coming months. I very much look forward to that. - PD 21, Mr. Ciaran McGinley has announced to his staff his “intention to take early retirement later this year, namely from 1st November onwards”. This announce has come as a great surprise: Mr McG has been a notorious EPO manager for his long and (hyper-?) active time in the EPO but is still far from the EPO statutory pension age of 65. - He has served in various positions, in particular as advisor to two EPO Presidents (worked under six of them), and is/was renowned for the legions of bold and staff-unfriendly reform ideas, which he repeatedly defended (against all parties preferably, in particular staff) with little diplomacy but with a remarkable skillful and eloquent stamina year after year… Just to cite one: the abolition of Automatic steps, which is unfortunately now a reality under Mr. Battistelli last career reform… So why should such a reform champion leave? - Surely, personal reasons must prevail (enough pension rights, financial sustainability, personal and professional plans, etc..). Or has this manager informations about an imminent pension reform, that staff does not know about (at least not the Staff representation), rendering a quick departure a tactically clever thing to do? However, most “great leaders” who identify with their organisation, tend to feel essential for the future of the office and often believe in being unreplaceable: so why stopping now so “early”, so suddenly Surely not for simple mundane criteria such as stability and safety. - Clearly when a herald of “tough” reforms thinks that “circumstances are now such that it is me for [him] to move on”, it does raise a few eye-brows… One cannot but have the impression that, perhaps, even for him, the radical provocateur he always likes(d) to posture himself, the present climate and today’s leadership may have gone a few unbearable steps too far. - The question is not if other staff or managers think along these lines (a look in the staff survey should be enough to know the answer): the question is when will the Administrative Council understand and act to stop this?